Strophurus ciliaris is highly variable in color. 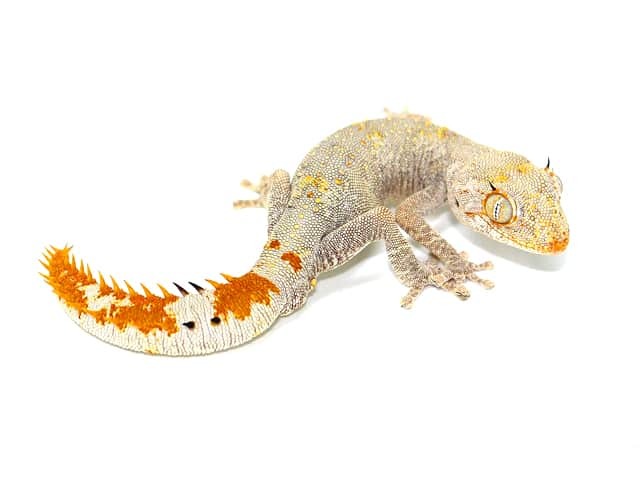 This species can vary from a uniform grey color, with few black or orange scales, to rich brown, with a mottled pattern of grey, white, and orange scales. Spines are present along the tail and long spines are generally present above the eyes, giving the impression of being eye-lashed. Female Strophurus ciliaris are known to be significantly larger than males. Interestingly, the inner body wall is lined with a special UV protection to shield the gecko from harmful rays owing to their sun-basking habits. The enclosure should be designed with various thin branches and cork, and a textured back wall is, of course, an advantage. Young animals can be housed in small tanks such as 0.3 x 0.3 x 0.4 meters (1 x 1 x 1.3 feet) while adult animals (1 male + 2 females) can be housed in terrariums such as 0.5 x 0.5 x 0.6 meters (1.6 x 1.6 x 2 feet). There should be different hiding places, so that the animals, which during the day are most clearly visible in the terrarium, can also hide when needed. A small container with a lid and a small opening from the top or the side should also be offered. This container can be about the size of 2 crickets cans. It should be filled with the same sand-soil mixture and also be kept moist, but not too wet. This box will enable females to lay their eggs, or provide to the animals optimum humidity to induce molting. As a substrate, we use a sand-soil mixture (mixture approx. 50/50) for our animals. Here, it should also be mentioned that the best grains of sand should be rounded. The lighting duration should be as in the summer months, ideally 12 – 14 hours. In the winter months, this should be adjusted accordingly, but about 8 to 10 hours should do the trick. For the heat source, I recommend you opt for the best, z. B. spot lamps or corresponding UVB lamps (Lucky Reptile BSD-50 Bright Sun UV Desert), which may be in continuous use as, in accordance with the power, they tend not to burn the animals hair. In the past few years they have developed some very good lamps that do not harm the welfare of animals. The important thing here, of course, is that it does not heat the entire terrarium. There must be a section of the terrarium where the animals can retreat to a cool temperature. UVB lamps are therefore very important for all Strophurus species because the nature of this species means it likes to be in direct contact with the sun (Bush inhabitants). However, the geckos should be able to choose this so that they can determine their solar usage themselves. Of course, the optimal dose of UVB radiation stimulates the metabolism and the health of the animals as it has a positive effect on their development and breeding. Additionally, the color develops very nice. Advantageously, terrariums have a stainless wire gauze roof top, allowing the heat source and the UVB radiation to work optimally. Keep always a shallow dish filled with fresh water. You should change the water every 2-3 days or when the water gets dirty. The geckos should be regularly sprayed 2 to 3 times a week in the evening. Here it is very important that no water-logging occurs and the water spray is almost completely dried up until the next morning. Permanent water-logging, can lead to infection because it can multiply bacteria by eight times in the terrarium, so this should be avoided at all costs and ensure the terrarium is sufficiently ventilated. Typical food includes insects. In addition to the usual crickets are smaller cockroaches species or wax worms, as well as (from time to time for adult Strophurus c. ciliaris) skinned black beetle larvae (Zophobas). It should, of course, also be ensured that there is a variety of nutritious food available, because wax worms or darkling beetle larvae alone can lead to unwanted fatty degeneration of the animals, which of course in turn brings diseases of the liver or other organs with it. The healthy mix of various food options is important. There should be great value placed on feeding animals with good food; keep all foods in a large container and provide fresh forage or high-quality dry food. Giving animals the appropriate vitamins and minerals, of course, should also be done on a regular basis, but this is only effective in conjunction with UVB radiation and for the vitamin D3 not to be administered in too large quantities, because it is synthesized by UVB. Again, pay attention to a healthy mix ratio. It is also very important that you do not use vitamins for more than 1.5-2 months. There is no use in buying vitamins in bulk unless you have a large inventory of animals to administer to vitamins to. I prefer not to handle them like some people do it with leopard geckos, for example. Observing them is better. Ciliaris is one of the more relaxed Strophurus species, so handling will not be a problem, but sometimes more nervous animals, can squirt some bad liquids out of there tails. Those smell bad and can hurt getting them into the eyes or so. Clean the terrarium every few days. This also involves cleaning the glass front windows every 10 to 14 days. A complete clean of the tank is required every few weeks. It’s important to always observe the enclosure to make sure that it is clean. They shed every few weeks depending on age and depending on summer or winter time. They do not eat their shed skin, it drops down. Rough surfaces or the branches help them to rub the skin off. Always keep a moist hide and spray the enclosure twice a week when in shedding period. We have not faced any health issues with our geckos. We always keep them on a very good diet and correct UVB exposure. Following our tips will keep your geckos healthy.